A few weeks ago I was wandering through a local Macy’s department store and while in the watch section I noticed they had a several copies of the black and green Casio G-Shock Rangeman GW-9400. They had five or six in black, but only three in the military / OD green. I was intrigued by the Rangeman because I had read some limited information about this new model of G-Shock a few months prior on the Internet. The Rangeman GW-9400 was announced back in September 2013 as a continuation of the “Master of G” line, which is supposed to be Casio’s line of G-Shock watches angled towards the most ‘extreme’ use. The Rangeman incorporates weather reading features of the Casio PRO TREK line, but in a case design more militaristic in feel. I ended up trying on a GW-9400-3CR (green) Rangeman and decided to buy it. Macy’s tag price is $300USD (which I believe is the US MSRP), but they had a 25% coupon that I took advantage of. While I was getting rung up at the counter, a woman came up and bought a green Rangeman noting to me that she went to a number of Macy’s in our area and this location was the only one that had any. 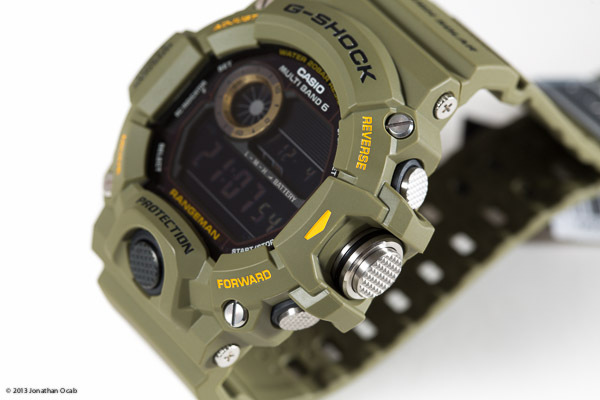 Between her and I buying green Rangeman G-Shocks, that left one more in the display case. 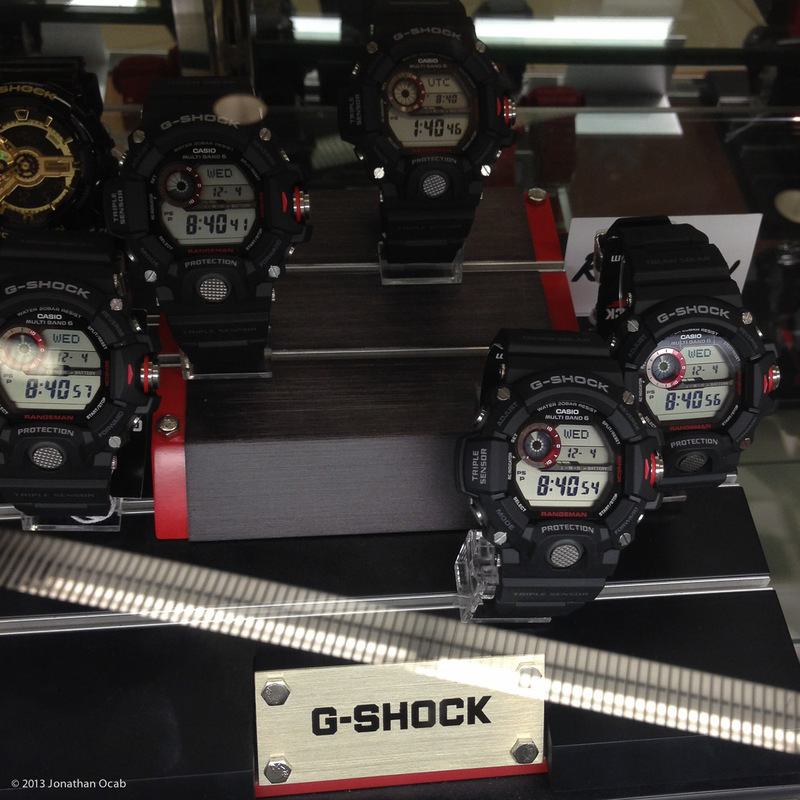 Note: I was in that same Macy’s location a week later and saw that they were out of the green GW-9400-3CR. It would appear that the military / OD green color scheme is popular. This would make sense since most operators wouldn’t wear black accessories, because it has been proven that black in camouflage schemes actually adversely affects blending with the environment. The core of the Rangeman is the Triple Sensor which measures compass bearing, altitude/atmospheric pressure, and temperature. The Triple Sensor is activated via a large button on the 3 o’clock side of the case and it gives quick readings each time the button is depressed to cycle through the readouts. The watch itself is pretty big, as are most G-Shocks. Even though it has a big, thick case, it wears comfortably. The lugs and rubber strap confirm to the wrist well. For reference, I have a 7″ wrist and the Rangeman GW-9400 measures 55.2 × 53.5 × 18.2 mm according to the Casio specifications sheet. 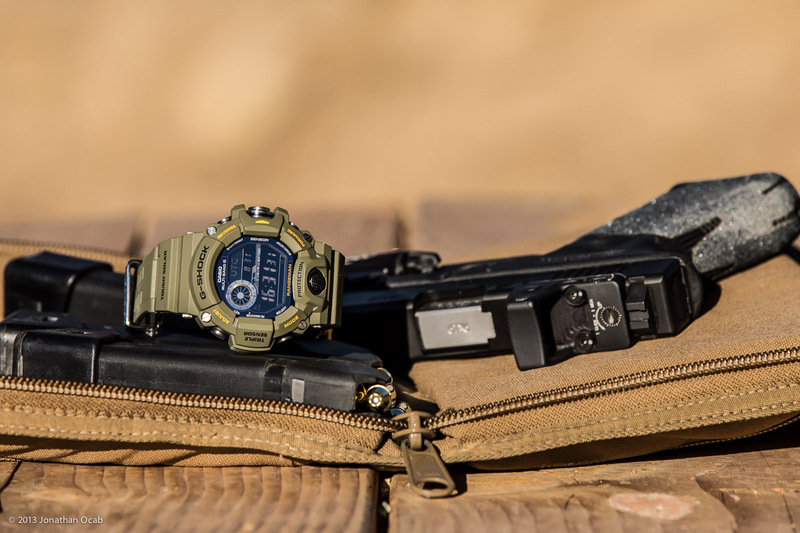 The Rangeman is also a “Tough Solar” watch, which means that it uses Casio’s solar battery technology, and has a water resistance of 20 bar (200 meters on the Casio specifications sheet). After wearing the watch a few times, I can say that it’s a fine G-Shock to use. From an operator standpoint, the watch doesn’t have enough bulkiness to hinder the use of a firearm, whether it be a long gun / carbine or a pistol. The buttons are are easy to index and press even with gloves on. The case ‘bumpers’ that extend beyond the pusher for the Triple Sensor activation do a good job in preventing accidental activation. 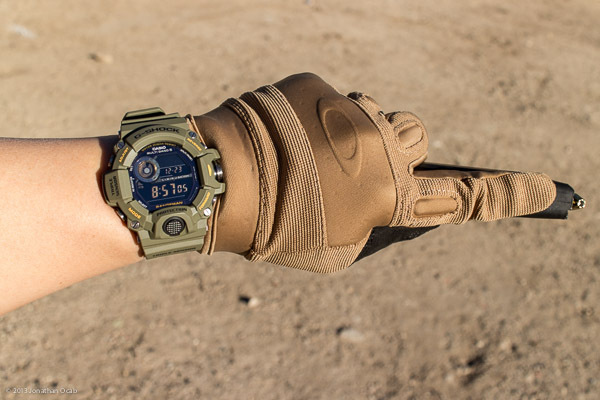 One thing I noticed about the Rangeman is that the atomic radio reception is far better than my other G-Shock atomic capable watch, the GW2310FB-1. Casio gives tips on how to get the watch to properly receive nightly updates from the atomic clock in Boulder, Colorado. Basically, placing the watch near a window, with the 12 o’clock side of the case facing towards the window. Ideally, the window should be facing the direction of the atomic radio signal (in my case, being in California, I should place the watch near a window facing east). Even if I follow those tips, my GW2310FB-1 sometimes still won’t update due to what I surmise to be an inability to receive the signal. But with the Rangeman GW-9400 that I have, even if I have it placed on top of a cabinet in a room away from any window, it will still receive the atomic signal and update. 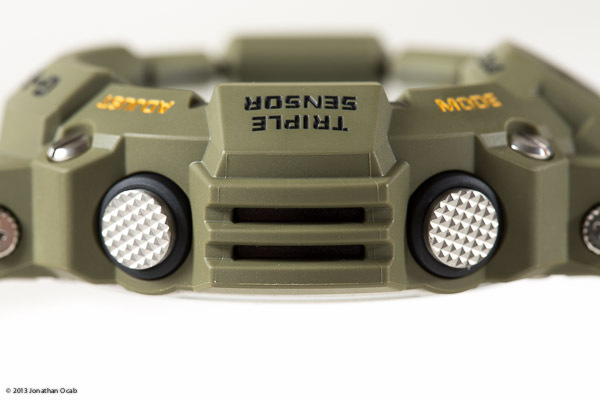 It would appear that the Rangeman has a better atomic reception module. As far as usefulness of the Triple Sensor features, I think the Rangeman is a nice supplemental tool for a rifle shooter, especially a competitive shooter like NRA High Power Rifle. While many military sniper teams will carry Kestrel weather meters, the Rangeman provides temperature and barometric pressure readings which are two of the most useful non-wind weather readings for ballistics. 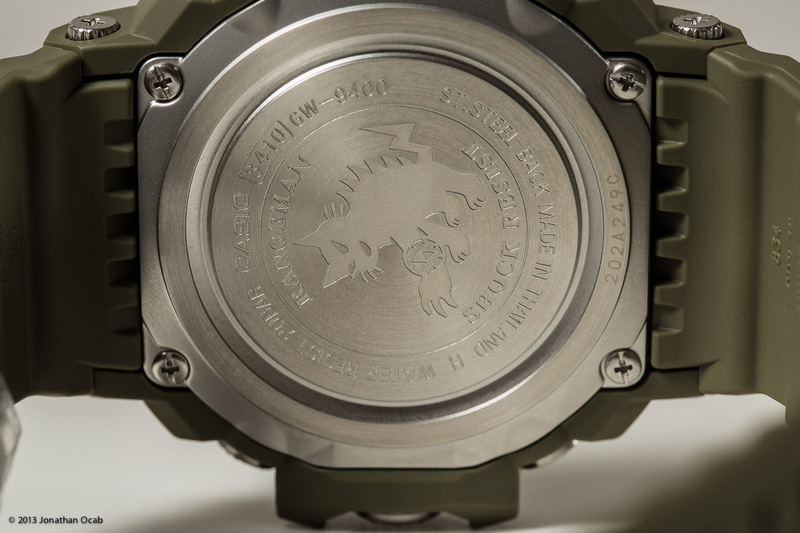 But the Rangeman also provides an altimeter, compass, and sunrise and sunset information. As a High Power Rifle competitor (albeit currently inactive), I would find all of the aforementioned useful for my data book because whenever I shoot at any given facility (e.g. Marine Corps Base Camp Pendleton ranges Wilcox 103 and NSW Range 116B, Ben Avery Shooting Facility in Phoenix, etc), I will record the time of day, location of the sun, wind direction, etc, before/after I shoot each stage of fire of the match. I would use the thermometer / temperature reading on the Rangeman since ambient temperature can play a factor on ammunition performance (ballistics), so I will want to record that in my data book for reference later. If I am shooting at a facility for the first time, the compass is helpful because the direction in which I am shooting will give me an idea of where the sun will be moving in relation to me (and how I need to compensate for light changes on my iron sights and on my eyes), and the altimeter (in combination with barometric pressure) will give me an idea of how my rifle’s zeros might be different in comparison to other ranges I have shot at. For example, at Marine Corps Base Camp Pendleton which is near sea level, my rifle may need 60 clicks (1/4 MOA) of elevation from mechanical zero for a 600 yard zero. But at the Ben Avery Shooting Facility in Phoenix (Arizona) which has an elevation of roughly 1,110 feet above sea level, that same rifle may need only 56 clicks (1/4 MOA) of elevation from mechanical zero for a 600 yard zero. The sunrise/sunset information is also beneficial for a rifle shooter, especially in the field. Perhaps a scout-sniper team is at a hide / final firing position on a target waiting for the most ideal shot. If daylight is a factor (night vision scopes ineffective), they’ll have an idea of when they absolutely need to take the shot on target before the sunsets. 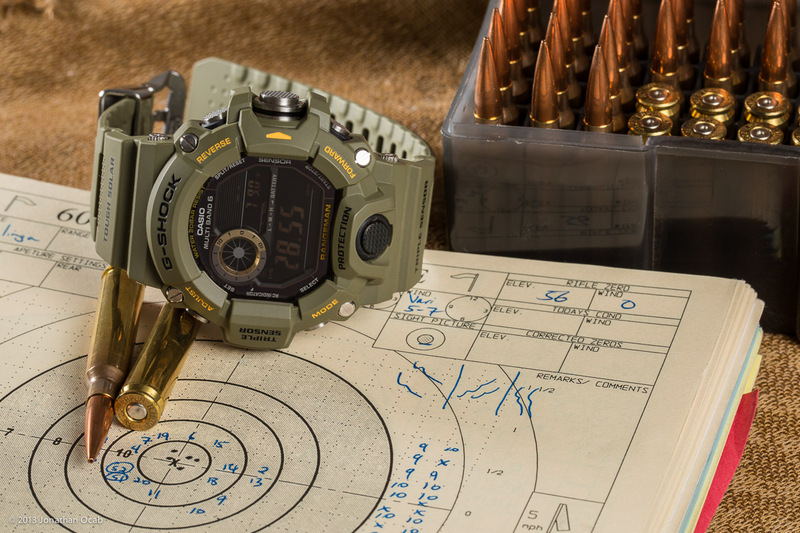 All this said, there’s not much I can fault on the Casio G-Shock Rangeman GW-9400. It’s a solid watch and while it’s a bit pricier than your average G-Shock at $300USD, you get a lot of features out of it. The online pricing is a bit all over the place with a lot of vendors selling Japanese ‘import’ copies (versions meant for Japanese domestic market sales) for around $400. The Rangeman GW-9400 (GW-9400-1 and GW-9400-3, black and green, respectively) is still relatively new as they appear to be trickling out to retailers. Considering Macy’s is an authorized Casio dealer that’s pretty much everywhere in the United States, and offers coupons / sales on a regular basis, I would just wait until you come across a Casio G-Shock Rangeman in-store while there’s a sale as opposed to ordering one online at a premium. I’m pretty sure that after the holiday season passes, there will be a larger supply in-stores at a discount. I am Brazilian , but the shipping is free or Brazil within the US itself is free and you delivery throughout the US site and you have other models in quantity and type proterk Casio PRG -130y and have a discount in quantity. Great write up! How accurate would you say the sensors on the watch are (aside from the temperature variations due to the watch being worn)? I haven’t tested the other readings, so I can’t say how accurate the altimeter or barometer is. Altimeter is probably an easy test (based on known location altitudes), but I’ll need another weather meter (e.g. Kestrel) to test the barometer. What kind of gloves are you wearing? Cheers for the thorough review. I’m thinking of adding this to my collection.